Feliformia is one of two suborders within the order Carnivora and consists of the "cat-like" carnivores, such as the felids (true cats), hyenas, mongooses, civets, and related taxa. The other suborder of Carnivora is Caniformia, the "dog-like" carnivores, such as dogs, wolves, bears, weasels, skunks, and pinnipeds. One shared characteristic distinguishes Carnivora from all other mammals: the possession of the four carnassial teeth in the front of the jaw. Feliforms are diagnostically distinguished from Caniforms by having auditory bullae that are double-chambered, composed of two bones joined by a septum. Feliforms are a diverse terrestrial grouping of over 100 species of varied forms, behaviors, and habitats. However, they are united by a concern of modern science to classify organisms according to shared lineage. The Carnivora order is divided into the suborders Feliformia (cat-like) and Caniformia (dog-like), the latter of which includes the pinnipeds. Feliformia includes such families as Felidae (the "true cats"), Hyaenidae (hyenas and aardwolves), Herpestidae (mongooses), and Viverridae (true civets), and related extant and extinct taxa. Some of the major sub-groups within Caniformina are the families Canidae (dogs, wolves, and foxes), Ursidae (bears), Mustelidae (weasels, badgers, and otters), and Mephitidae (skunks), as well as the pinnipeds (seals, sea lions, and walruses). The separation of Carnivora into the broad groups of Feliforms and Caniforms is widely accepted as is the definition of Feliformia and Caniformia as suborders (sometimes superfamilies). The classification of Feliform families as part of the Feliformia suborder, or under separate groupings, continues to evolve. For example, newer classifications have separated the civets into three families (Nandiniidae, Viverridae, and Eupleridae) and the new family Eupleridae was created and includes the Malagasy carnivores. Systematic classifications dealing only with extant taxa (Myers et al. 2008) include all feliforms into the Feliformia suborder, though variations exist in the the definition and grouping of families and genera. Systematic classifications dealing with both extant and extinct taxa vary more widely. Some separate the feliforms (extant and extinct) as Aeluroidea (superfamily) and Feliformia (suborder), while others include all feliforms (extant, extinct, and "possible ancestors") into the Feliformia suborder (Systema Naturae 2000; PBD 2008). Recent studies suggest this inclusion of "possible ancestors" into Feliformia (or even Carnivora) may be spurious (Wesley-Hunt and Flynn 2005). All extant feliforms share a common attribute: the characteristics of their auditory bullae, the bony capsules enclosing the middle and inner ear. This is a key diagnostic in classifying species as Feliform versus Caniform. 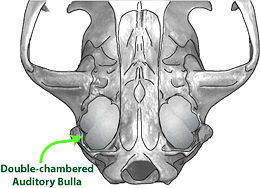 In feliforms, the auditory bullae are double-chambered, composed of two bones joined by a septum. Caniforms have single-chambered or partially divided auditory bullae, composed of a single bone. The specific characteristics of extant feliform bullae suggest a common ancestor, though one has not been identified in the fossil records. There are other characteristics that differentiate feliforms from caniforms and probably existed in their stem taxa. But due to speciation, these do not apply unambiguously to all extant species. Feliforms tend to have shorter rostrums than caniforms, fewer teeth, and more specialized carnassials. Feliforms tend to be more carnivorous and are generally ambush hunters. Caniforms tend more toward omnivorous and opportunity-based feeding. Most Feliforms have retractile (retractable) or semi-retractile claws and many are arboreal or semi-arboreal. Feliforms also tend to be more digitigrade (walking on toes). In contrast, Caniforms are terrestrial (except Procyonidae), have non-retractile claws, and (except for the Canidae) tend to be plantigrade (walking with the podials and metatarsals flat on the ground). There are six extant families, twelve subfamilies, 56 genera, and 114 species in the Feliformia suborder. They range natively across all continents except Australia and Antarctica. Most species are arboreal or semi-arboreal ambush hunters. Target prey varies based on the species size and available food sources (with the larger species feeding mainly on large mammals and the smallest species feeding on insects or invertebrates). An overview of each family is provided here. Eupleridae. 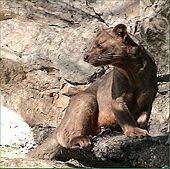 Family Eupleridae, the "Malagasy carnivores," includes fossa, falanouc, Malagasy civet, and Malagasy mongooses, all of which are restricted to the island of Madagascar. There are eight species in the family. Variations in form among the eight species are significant, however. These differences initially led to the species in this family sharing common names with, and being placed in the different families of, seemingly more similar species on the mainland (e.g. civets and mongoose). However phylogenetic analysis of DNA provides strong evidence that all Malagasy carnivores evolved from a single common ancestor that was a herpestid (Yoder et al. 2003; Yoder and Flynn 2003). Recent phylogenetic analysis supports this view and places all of the Malagasy carnivores in the family Eupleridae (Gaubert et al. 2005). The differences in form make it difficult to concisely summarize the species in this family. The range in size is as diverse as the range in form, with smaller species at less than 500 grams (one pound) and the largest species at up to 12 kilograms (26 pounds). Some have retractile or semi-retractile claws (the fossa and the Malagasy civet) and others do not (the falanouc and Malagasy mongooses). They all tend to have slender bodies and pointed rostra (except the fossa, which has a blunt snout). Diet varies with size and form of the species and, like their mainland counterparts, ranges from small mammals, insects and invertebrates through to crustaceans and mollusks. Hyaenidae. Family Hyaenidae (hyenas and aardwolf) has four extant species and two subspecies. All have non-retractile claws. They are extant in the Middle East, India, and Africa. 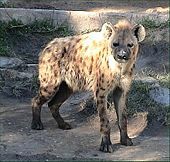 Hyenas are large, powerful animals, up to 80 kilograms (176 pounds) and represent one the most prolific large carnivores on the planet. The aardwolf is much smaller at 27 kilograms (60 pounds) and is a specialized feeder, eating mainly harvester termites. Herpestidae. Family Herpestidae (the mongooses, kusimanses, meerkat, etc.) has 32 species. Previously, these were placed in the Viverridae family. However, Wilson and Reeder (1993) established the herpestids as morphologically and genetically distinct from viverrids. They are extant in Africa, Middle East, and Asia. All have non-retractile claws. As a family, they are smaller, ranging from one kilogram (2.2 pounds) to 5 kilograms (11 pounds), and typically have long, slender bodies and short legs. Diet varies based on species size and available food sources, ranging from small mammals, birds to reptiles, insects and crabs. Some species are omnivorous, including fruits and tubers in their diet. Nandiniidae. Family Nandiniidae (African palm civet) has only one species (Nandinia binotata), extant across sub-Saharan Africa. They have retractile claws and are slender-bodied, arboreal omnivores (with fruit making up much of their diet). They are relatively small with the larger males weighing up to five kilograms (11 pounds). Viverridae. Family Viverridae (the binturong, civets, genets, Asiatic and African linsang) has 30 extant species and all have retractile or semi-retractile claws. They are extant in Southern Europe, Africa, and Asia. They range in size from 500 grams (one pound) up to medium-sized carnivores at 14 kilograms (39 pounds). They have long bodies and short legs and usually have long tails (some prehensile). Diet ranges from small mammals and insects through to crustaceans and mollusks. In the Middle Palaeocene (60 million years ago), miacids appear. Miacids were a group of paraphyletic taxa that are considered basal to Carnivora. They had Carnivora-like carnassials but lacked fully ossified auditory bullae. Miacids were small, presumably arboreal carnivores and, based on their size (roughly that of mongooses), probably fed on insects, small mammals and birds. The miacids are divided into two groups: the miacines, with a full complement of molars, and the viverravines with a reduced number of molars and more specialized carnassials. These dental differences resemble the difference between caniforms (with more teeth) and feliforms (with fewer teeth) but this may not mean evolutionary lineages. It was thought that Viverravidae was basal to the Feliforms. However, recent studies suggest this is not the case (Wesley-Hunt and John J. Flynn 2005). 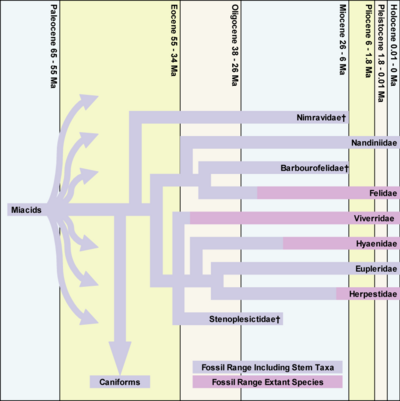 In the Middle Eocene (about 40 mya), the miacids started to branch into two distinct groups of the order Carnivora: the feliforms and caniforms. The miacid precursors to the feliforms remained forest-dwelling, arboreal or semi-arboreal ambush hunters, while the caniform precursors were more mobile, opportunistic hunters. While it is clear the first feliforms appeared at this time, there is no clear common ancestor of the feliform families in the fossil records. As forest dwellers, the early feliforms were subject to more rapid decomposition in the absence of sedimentary materials, resulting in large gaps in the fossil records. The diagram below presents a contemporary view of Feliformia evolution and familial relationships (cladogram) overlaid onto the geological time scale. The information presented is based on fossil records and systematic classifications. Gaubert, P., W. C. Wozencraft, P. Cordeiro-Estrela, and G. Veron. 2005. Mosaics of convergences and noise in morphological phylogenies: What's in a viverrid-like carnivoran? Syst Biol. 54(6):865-94. Myers, P., R. Espinosa, C. S. Parr, T. Jones, G. S. Hammond, and T. A. Dewey. 2008. Suborder Feliformia (feliform carnivores) Animal Diversity Web. Retrieved September 6, 2008. Paleaobiology Database (PBD). 2008. Paleaobiology Database Retrieved September 6, 2008. Systema Naturae 2000. n.d. Suborder Feliformia Systema Naturae 2000. Retrieved September 6, 2008. Wesley-Hunt, G. D., and J. J. Flynn. 2005. Phylogeny of The Carnivora: Basal relationships among the carnivoramorphans, and assessment of the position of "Miacoidea" relative to Carnivora Journal of Systematic Palaeontology 3: 1-28. Retrieved September 6, 2008. Yoder, A. D., M. Burns, S. Zehr, T. Delefosse, G. Veron, S. Goodman, J. Flynn. 2003. Single origin of Malagasy Carnivora from an African ancestor Nature 42:734-737. Retrieved September 6, 2008. This page was last modified on 26 December 2008, at 23:23.